KOPNHΛIA CALωNEINA CEB, Diademed draped bust right | LIE, Elpis standing left, hitching skirt right, holding flower left. Palm branch at feet left, regnal year right. From the last year of her husband's reign, the Alexandrian year (which began at the end of August) 15. Coins of Roman Egypt at this time are thick coins of bronze, with a slight silver content. Sometimes the alloy is called billon, to indicate that silver, and sometimes potin, to denote that the alloy includes some lead. 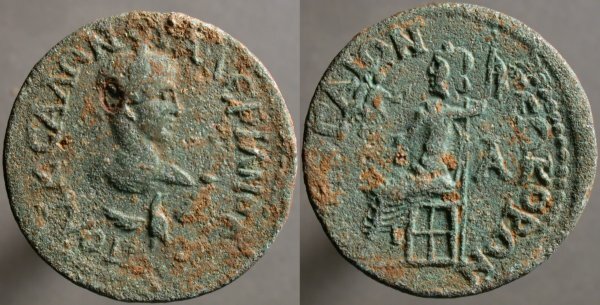 While the quality is reduced further in succeeding reigns, Alexandrian coins served as my introduction to Provincial coins, where the standards of beauty are different. Amend the constitution, overturn Kelo v. New London. 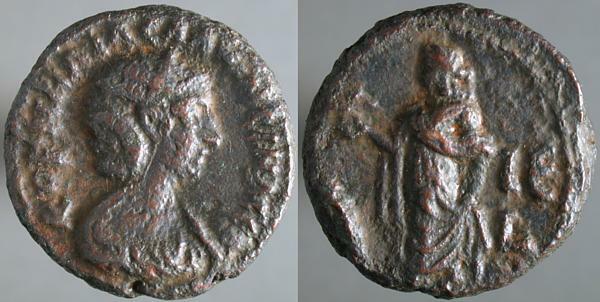 SALONINA AVG, Diademed draped bust right on crescent | VESTA, Vesta seated left, holding Palladium in right hand and scepter in left. As coins of this reign go, this one appears to have a rather good silver content, marking it as an early issue, from the years before the metal used was bronze with a bit of silver at the surface. 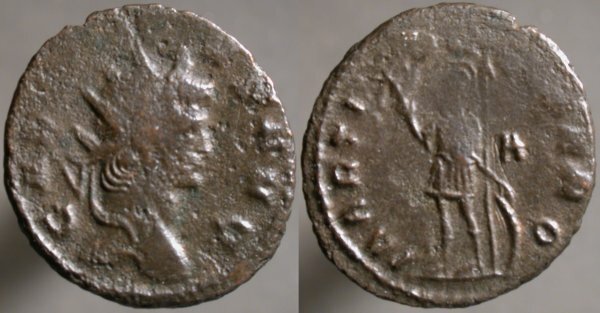 For all the fascination with history that comes with collecting Roman coins, there's still a sense of amassing a great horde of treasure, and that works better if it's not all coppery-looking bronze. 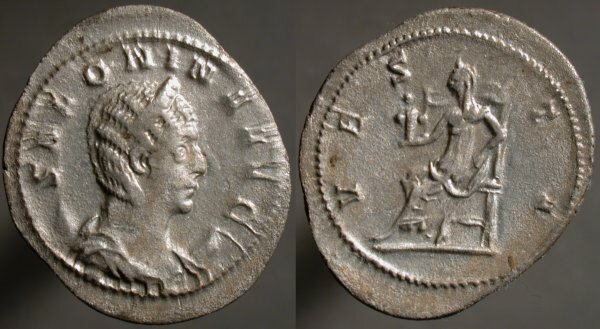 IMP MAXIMINIANVS P F AVG, Laureate head right | SALVIS AVGG ET CAESS FEL KART, Carthage standing facing, head left, in long robe, holding fruits in right hand and grain ears in left. I in left field, B in exergue. 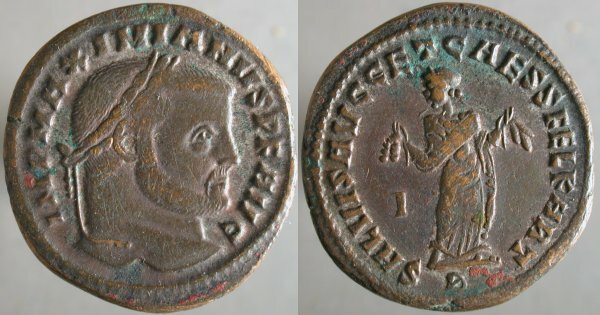 A month ago I posted a coin of Diocletian and two weeks ago one of Maximian, his partner in the tetrarchy that was intended to promote stability by enforcing peaceful transitions as Emperors were replaced. In this system, each Emperor would select a Caesar, a protege he'd groom to replace him and who would then choose his own Caesar. Gaius Galerius Valerius Maximianus was Diocletians's choice. His initial military action was a famous defeat along the Euphrates which cost Rome the province of Mesopotamia. Diocletian was, it seems, a patient man, and Galerius improved his skills and his luck. Acceeding as Emperor on the retirement of Diocletian (and, for a time, of Maximian) in 305, he accomplished little but a relentless persecution of Christians. When he died in 311 of some loathsome rot from within, Christians were not slow to claim an act of God. The strong of stomach may go here and particularly note the part beginning “For an abscess suddenly appeared in the midst of the secret parts of his body”. ΠΟ ΛΙΚ CΛΛΩΝ ΟVΑΛΕΡΙΑΝΟ CΕ, Laureate draped bust (of Saloninus) right over eagle with wings spread, I before | ΠΕΡΓΑΙΩΝ ΝΕΩΚΟΡΩΝ, Zeus seated left, holding spear right and Nike, who presents him with a wreath, left. A in right field. Same story as yesterday, oh how much the same. Like a relatively common coin I've previously posted, save for an "A" in the right field instead of the left. The "A" mark here presumably claims the primacy of the city of Perga, rather than declaring the identity of the workshop, as provincial mints seem to have been smaller operations without workshops, serving a smaller market. It is, I understand now, foolish to assume that this narrow focus on minutiae is true for collectors in general. It's true for me. though. The greater truths are, perhaps, reserved for real scientific numismatists. Those great truths may be arrived at after enough little truths are accumulated. Some of those little truths, it may be, I can reach. GALLIENVS AVG, Radiate head right | MARTI PACIFERO, Mars standing left, raising branch in right hand, resting left hand on shield and spear. A in right field. If to be a collector is to focus on details that noone else cares about, this is even more true when a collector specializes. Göbl attests 158 examples of 570a, identical to this but the "A" on the reverse (which indicates that this is a product of the first officina or workshop) is in the left field. Only four examples of this, marked in the left field, are attested. A single example of 572a, marked in the exergue, the ground-line beneath Mars, is attested. I still have something to seek. [?] CAΛΩNIN, Draped and diademed bust to right, crescent behind shoulders, I before | [VΠAIΠPHNΩN EΠICTPA], Nike advancing to left, holding palm and crowning cultus statue of Artemis Anaitis, facing. ΛOV in exergue. I had no luck searching for a good page on Anaitis, a local Lydian goddess (and later, Zoroastrian water-goddess) associated with Artemis. How frustrating.